All animals whatsoever, whether they fly or swim or walk upon dry land, whether they bring forth their young alive or in the egg, develop in the same way. In The Works of Aristotle: Historia Animalium (350 BC), (The History of Animals), Book VII, Part 7, 586a21 translated in William David Ross and John Alexander Smith (eds. ), D’Arcy Wentworth Thompson (trans. ), (1910), Vol. 4, 27. From 'What Do They Think', The Thing: Why I Am Catholic (1929), 78. In Collected Works (1990), Vol. 3, 191. But psychoanalysis has taught that the dead—a dead parent, for example—can be more alive for us, more powerful, more scary, than the living. It is the question of ghosts. Quoted in 'Jacques Derrida,' by Mitchell Stephens, New York Times Magazine (January 23, 1994). But, however many ways there may be of being alive, it is certain that there are vastly more ways of being dead, or rather not alive. The Blind Watchmaker (1996), 9. By the year 2070 we cannot say, or it would be imbecile to do so, that any man alive could understand Shakespearean experience better than Shakespeare, whereas any decent eighteen-year-old student of physics will know more physics than Newton. In Mathematical Recreations and Problems (1896), 180; See also De Morgan’s Budget of Paradoxes (1872), 172. 'Bird Reserves at the Mouth of the Mississippi', A Book-Lover's Holidays in the Open (1920), 300-301. Doctor says he would be a very sick man if were still alive today. Don’t think of organ donations as giving up part of yourself to keep a total stranger alive. It’s really a total stranger giving up almost all of themselves to keep part of you alive. 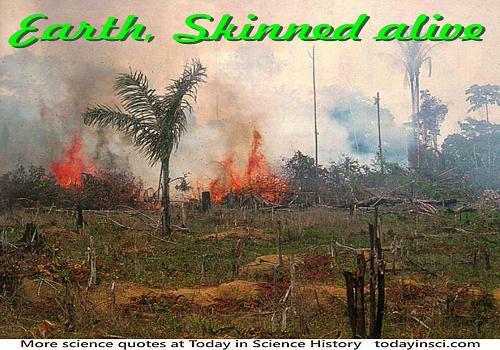 Deforestation of Amazon forest by burning to clear for grazing lands. Every creature alive on the earth today represents an unbroken line of life that stretches back to the first primitive organism to appear on this planet; and that is about three billion years. In talk, 'Origin of Death' (1970). Every individual alive today, even the very highest, is to be derived in an unbroken line from the first and lowest forms. In Heredity (1892), Vol. 1, 161. As cited in James C. Fernald Scientific Side-lights: Illustrating Thousands of Topics by Selections from Standard Works of the Masters of Science Throughout the World (1903), 394. I now saw very distinctly that these were little eels or worms... Lying huddled together and wriggling, just as if you saw with your naked eye a whole tubful of very little eels and water, the eels moving about in swarms; and the whole water seemed to be alive with the multitudinous animalcules. For me this was among all the marvels that I have discovered in nature the most marvellous of all, and I must say that, for my part, no more pleasant sight has yet met my eye than this of so many thousands of living creatures in one small drop of water, all huddling and moving, but each creature having its own motion. Letter to H. Oldenburg, 9 Oct 1676. In The Collected Letters of Antoni van Leeuwenhoek (l957), Vol. 2, 115. Part of a longer quote that begins, “You disembowel the animal…” on the Jean-Henri Fabre Quotes page of this website. I think work is a privilege. ... It keeps you alive, spiritually. If Darwin were alive today the insect world would delight and astound him with its impressive verification of his theories of the survival of the fittest. Under the stress of intensive chemical spraying the weaker members of the insect populations are being weeded out… . Only the strong and fit remain to defy our efforts to control them. In Silent Spring (1952, 1962), 263. In my work on Fossil Bones, I set myself the task of recognizing to which animals the fossilized remains which fill the surface strata of the earth belong. ... As a new sort of antiquarian, I had to learn to restore these memorials to past upheavals and, at the same time, to decipher their meaning. I had to collect and put together in their original order the fragments which made up these animals, to reconstruct the ancient creatures to which these fragments belonged, to create them once more with their proportions and characteristics, and finally to compare them to those alive today on the surface of the earth. This was an almost unknown art, which assumed a science hardly touched upon up until now, that of the laws which govern the coexistence of forms of the various parts in organic beings. In the information age, you don’t teach philosophy as they did after feudalism. You perform it. If Aristotle were alive today he’d have a talk show. It is probable that all organisms now alive are descended from one ancestor, for the following reason. Most of our structural molecules are asymmetrical, as shown by the fact that they rotate the plane of polarized light, and often form asymmetrical crystals. But of the two possible types of any such molecule, related to one another like a right and left boot, only one is found throughout living nature. The apparent exceptions to this rule are all small molecules which are not used in the building of the large structures which display the phenomena of life. In 'The Origin of Life', The Inequality of Man: And Other Essays (1932), 157. It isn’t easy to become a fossil. … Only about one bone in a billion, it is thought, becomes fossilized. If that is so, it means that the complete fossil legacy of all the Americans alive today—that’s 270 million people with 206 bones each—will only be about 50 bones, one-quarter of a complete skeleton. That’s not to say, of course, that any of these bones will ever actually be found. In A Short History of Nearly Everything (2003), 321-322. It was on the 25th November 1740 that I cut the first polyp. I put the two parts in a flat glass, which only contained water to the height of four to five lignes. It was thus easy for me to observe these portions of the polyp with a fairly powerful lens. I shall indicate farther on the precautions I took in making my experiments on these cut polyps and the technique I adopted to cut them. It will suffice to say here that I cut the polyp concerned transversely, a little nearer the anterior than the posterior end. The first part was thus a little shorter than the second. The instant that I cut the polyp, the two parts contracted so that at first they only appeared like two little grains of green matter at the bottom of the glass in which I put them—for green, as I have already said, is the colour of the first polyps that I possessed. The two parts expanded on the same day on which I separated them. They were very easy to distinguish from one another. The first had its anterior end adorned with the fine threads that serve the polyp as legs and arms, which the second had none. The extensions of the first part was not the only sign of life that it gave on the same day that it was separated from the other. I saw it move its arms; and the next day, the first time I came to observe it, I found that it had changed its position; and shortly afterwards I saw it take a step. The second part was extended as on the previous day and in the same place. I shook the glass a little to see if it were still alive. This movement made it contract, from which I judged that it was alive. Shortly afterwards it extended again. On the following days I saw the same thing. In Mémoires, pour servir à l'histoire d'un genre de polyps d'eau douce à bras en forme de cornes (1744), 7-16. Trans. John R. Baker, in Abraham Trembley of Geneva: Scientist and Philosopher 1710-1784 (1952), 31. Language is simply alive, like an organism. We all tell each other this, in fact, when we speak of living languages, and I think we mean something more than an abstract metaphor. We mean alive. Words are the cells of language, moving the great body, on legs. Language grows and evolves, leaving fossils behind. The individual words are like different species of animals. Mutations occur. Words fuse, and then mate. Hybrid words and wild varieties or compound words are the progeny. Some mixed words are dominated by one parent while the other is recessive. The way a word is used this year is its phenotype, but it has deeply immutable meanings, often hidden, which is its genotype.... The separate languages of the Indo-European family were at one time, perhaps five thousand years ago, maybe much longer, a single language. The separation of the speakers by migrations had effects on language comparable to the speciation observed by Darwin on various islands of the Galapagos. Languages became different species, retaining enough resemblance to an original ancestor so that the family resemblance can still be seen. in 'Living Language,' The Lives of a Cell: Notes of a Biology Watcher, (1974, 1984), 106. Life is a thin narrowness of taken-for-granted, a plank over a canyon in a fog. There is something under our feet, the taken-for-granted. A table is a table, food is food, we are we—because we don’t question these things. 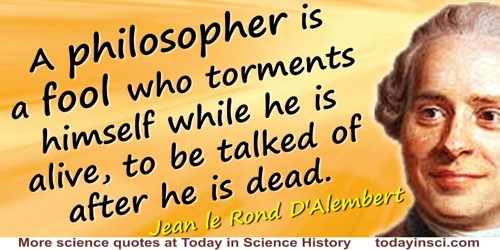 And science is the enemy because it is the questioner. Faith saves our souls alive by giving us a universe of the taken-for-granted. From a 1923 journal entry. As quoted in The Ghost in the Little House, ch. 7, by William V. Holtz (1993). Many a diabetic has stayed alive by stealing the bread denied him by his doctor. Most of us have had moments in childhood when we touched the divine presence. We did not think it extraordinary because it wasn’t; it was just a beautiful moment filled with love. In those simple moments our hearts were alive, and we saw the poignant beauty of life vividly with wonder and appreciation. My mind seems to have become a kind of machine for grinding general laws out of large collections of facts, but why this should have caused the atrophy of that part of the brain that alone on which the higher tastes depend, I cannot conceive. A man with a mind more highly organised or better constituted than mine would not, I suppose, have thus suffered, and if I had to live my life over again, I would have made a rule to read some poetry and listen to some music at least once every week; for perhaps the parts of my brain now atrophied would thus have been kept alive through use. In Charles Darwin and Francis Darwin (ed. ), Charles Darwin: His Life Told in an Autobiographical Chapter, and in a Selected Series of His Published Letters (1892), 51. My Rainforests Project … has three main elements. 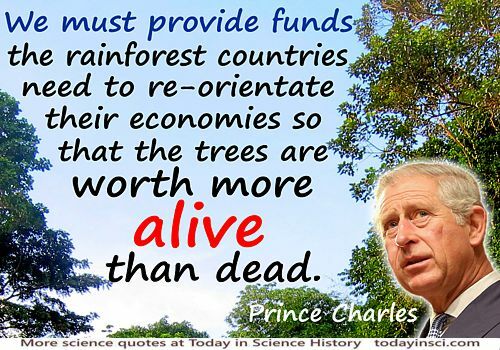 Firstly, to determine how much funding the rainforest countries need to re-orientate their economies so that the trees are worth more alive than dead. and has something comparable to that which we call sanity in ourselves. The only oneness is the oneness of sanity. 'The Sane Universe', David Herbert Lawrence, The Works of D.H. Lawrence (1994), 428. In Middlemarch: A Study of Provincial Life (1873), 255. The art of progress is to preserve order amid change and to preserve change amid order. Life refuses to be embalmed alive. The more prolonged the halt in some unrelieved system of order, the greater the crash of the dead society. In Process and Reality: An Essay in Cosmology (1929), 515. As cited in Paul Grimley Kuntz, Alfred North Whitehead (1984), 14. The dog writhing in the gutter, its back broken by a passing car, knows what it is to be alive. So too with the aged elk of the far north woods, slowly dying in the bitter cold of winter. The asphalt upon which the dog lies knows no pain. The snow upon which the elk has collapsed knows not the cold. But living beings do. … Are you conscious? Then you can feel more pain. … Perhaps we even suffer more than the dumb animals. In The Symbiotic Universe: Life and Mind in the Cosmos (1988), 194-195. As quoted and cited in Robert E. Zinser, The Fascinated God: What Science Says to Faith and Faith to Scientists (2003), 521. The other experiment (which I shall hardly, I confess, make again, because it was cruel) was with a dog, which, by means of a pair of bellows, wherewith I filled his lungs, and suffered them to empty again, I was able to preserve alive as long as I could desire, after I had wholly opened the thorax, and cut off all the ribs, and opened the belly. Nay, I kept him alive above an hour after I had cut off the pericardium and the mediastinum, and had handled and turned his lungs and heart and all the other parts of its body, as I pleased. My design was to make some enquiries into the nature of respiration. But though I made some considerable discovery of the necessity of fresh air, and the motion of the lungs for the continuance of the animal life, yet I could not make the least discovery in this of what I longed for, which was, to see, if I could by any means discover a passage of the air of the lungs into either the vessels or the heart; and I shall hardly be induced to make any further trials of this kind, because of the torture of this creature: but certainly the enquiry would be very noble, if we could any way find a way so to stupify the creature, as that it might not be sensible. Letter from Robert Hooke to Robert Boyle (10 Nov 1664). In M. Hunter, A. Clericuzio and L. M. Principe (eds. ), The Correspondence of Robert Boyle (2001), Vol. 2, 399. The real purpose of scientific method is to make sure Nature hasn’t misled you into thinking you know something you don’t actually know. There’s not a mechanic or scientist or technician alive who hasn’t suffered from that one so much that he’s not instinctively on guard. … If you get careless or go romanticizing scientific information, giving it a flourish here and there, Nature will soon make a complete fool out of you. In Zen and the Art of Motorcycle Maintenance: An inquiry into Values (1974), 100-101. The unprecedented development of science and technology... so rapid that it is said that 90 per cent of the scientists which this country has ever produced are still living today. Reflections on Medicine and Humanism: Linacre Lecture (1963), 328. Then I had shown, in the same place, what the structure of the nerves and muscles of the human body would have to be in order for the animal spirits in the body to have the power to move its members, as one sees when heads, soon after they have been cut off, still move and bite the ground even though they are no longer alive; what changes must be made in the brain to cause waking, sleep and dreams; how light, sounds, odours, tastes, warmth and all the other qualities of external objects can impress different ideas on it through the senses; how hunger, thirst, and the other internal passions can also send their ideas there; what part of the brain should be taken as “the common sense”, where these ideas are received; what should be taken as the memory, which stores the ideas, and as the imagination, which can vary them in different ways and compose new ones and, by the same means, distribute the animal spirits to the muscles, cause the limbs of the body to move in as many different ways as our own bodies can move without the will directing them, depending on the objects that are present to the senses and the internal passions in the body. This will not seem strange to those who know how many different automata or moving machines can be devised by human ingenuity, by using only very few pieces in comparison with the larger number of bones, muscles, nerves, arteries, veins and all the other parts in the body of every animal. They will think of this body like a machine which, having been made by the hand of God, is incomparably better structured than any machine that could be invented by human beings, and contains many more admirable movements. Discourse on Method in Discourse on Method and Related Writings (1637), trans. Desmond M. Clarke, Penguin edition (1999), Part 5, 39-40. To encounter the sacred is to be alive at the deepest center of human existence. Little Science, Big Science (1963), 1-2. We think of something that has four legs and wags its tail as being alive. We look at a rock and say it’s not living. Yet when we get down to the no man’s land of virus particles and replicating molecules, we are hard put to define what is living and what is non-living. From interview, 'The Seeds of Life', in The Omni Interviews (1984), 4. 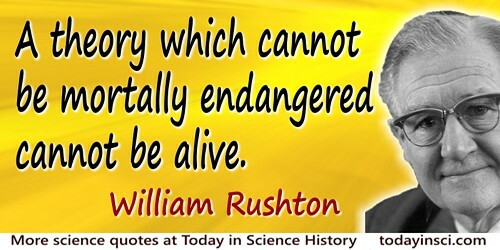 What can be more important than the science of life to any intelligent being who has the good fortune to be alive? Epigraph in Isaac Asimov’s Book of Science and Nature Quotations (1988), 36. What humanity owes to personalities like Buddha, Moses, and Jesus ranks for me higher than all the achievements of the enquiring and constructive mind. What these blessed men have given us we must guard and try to keep alive with all our strength if humanity is not to lose its dignity, the security of its existence, and its joy in living. When the earth came alive it began constructing its own membrane, for the general purpose of editing the sun. In The Lives of a Cell (1974), 171. You disembowel the animal and I study it alive; you make it an object of horror and pity, and I make it love you; you work in a torture and dismemberment workshop, I observe under the blue sky, on the cicadas’ song; … you scrutinize death, I scrutinize life. From the original French, “Vous éventrez la bête et moi je l'étudie vivante ; vous en faites un objet d'horreur et de pitié, et moi je la fais aimer; vous travaillez dans un atelier de torture et de dépècement, j'observe sous le ciel bleu, au chant des cigales; … vous scrutez la mort, je scrute la vie.” In 'L’Harmas', Nouveaux Souvenirs entomologiques: Études sur l’instinct et les mœurs des Insectes (1882), 3. English version by Webmaster using Google translate. [Boundless curiosity.] That’s what being alive is about. I mean, it’s the fun of it all, making sense of it, understanding it. There’s a great pleasure in knowing why trees shed their leaves in winter. Everybody knows they do, but why? If you lose that, then you’ve lost pleasure. From interview with Sophie Elmhirst, 'I Think the BBC Has Strayed From the Straight and Narrow', New Statesman (10 Jan 2011), 140, No. 5035, 32.